Properly deploying Cloud computing can provide many benefits which vary depending on your organization. Unfortunately, there is considerable marketing hype in the market place as companies with older technologies, perhaps even antiquated technology platforms, attempt to re-position themselves as Cloud computing service providers by redefining Cloud computing. Without a clear understanding of the newer technologies and the style in which to best deploy them, it can be difficult to create a risk/benefit analysis, a clear return on investment/total cost of ownership analysis, and develop a cloud adoption strategy that best fits your organization to which you and the executive team will have confidence in. 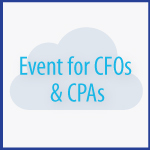 To further your understanding, join us Tuesday, August 19th for a webcast entitled, “Cloud Technologies for CFOs and CPAs”. Taylor Macdonald, recognized by ACCOUNTING TODAY as one of the 100 Most Influential People in Accounting (2010-2013) and a vice president at cloud accounting software provider INTACCT, will be discussing insights into cloud technologies affecting accounting and finance, along with future trends for the industry. Mike Shah, VP of Finance of PAYMETRIC, a leader in integrated, secure electronic payment management, will also be sharing the challenges his company faced with an earlier financial system and answering questions about their decision to move to the cloud.